Why does she climb? Why does she jump? During a junior semester in Florence on a Syracuse University program, Min, an economics and studio art double major, won best in show for this oil painting, The Lady and the Ladder. 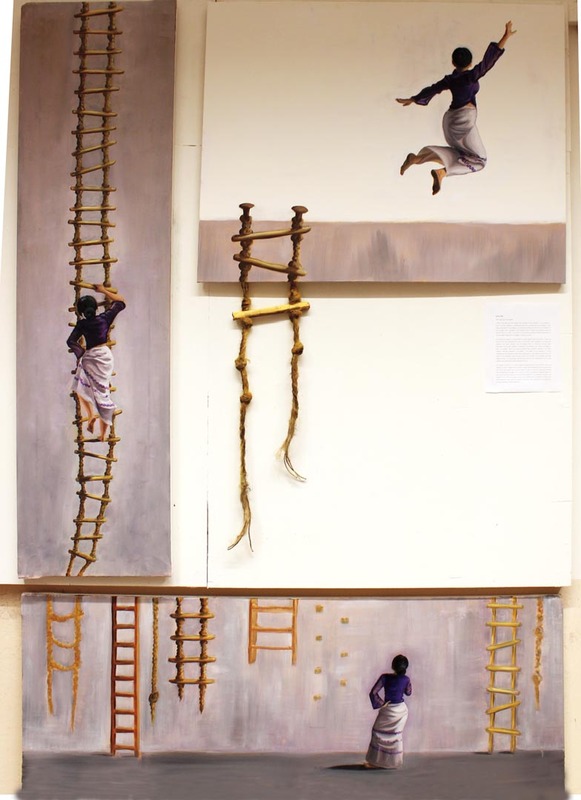 During a junior semester in Florence on a Syracuse University program, Sophy Min ’12 won best in show for this oil painting, The Lady and the Ladder. As a Myanmar citizen moving through Italy and Europe, Min had to travel carefully, and was subject to racial profiling by border authorities, sometimes mistaken for a Chinese citizen traveling illegally. In the painting, the Lady’s face is hidden — “as an artist I do not want to tell viewers who this is” — as she seems to advance slowly, rung by rung. She has to hike her native skirt, called a longyi, which is unsuited for climbing because it’s worn snugly by pulling the fabric to one side, then folding and tucking into the opposite side. A cool exhibition on astrophotography is at the Museum of Art through Dec. 15, 2012. Current student bands include Almost Awkward and AndroSkaggin. Lecturer Robert Feintuch showed his paintings at the Akira Ikeda Gallery, Berlin. The dance program “went major” in 20II, and the first Bates dance majors just graduated. The specialty of teaching voice and speech requires a nuanced understanding of both the anatomy of the voice and the art of using it to establish character. 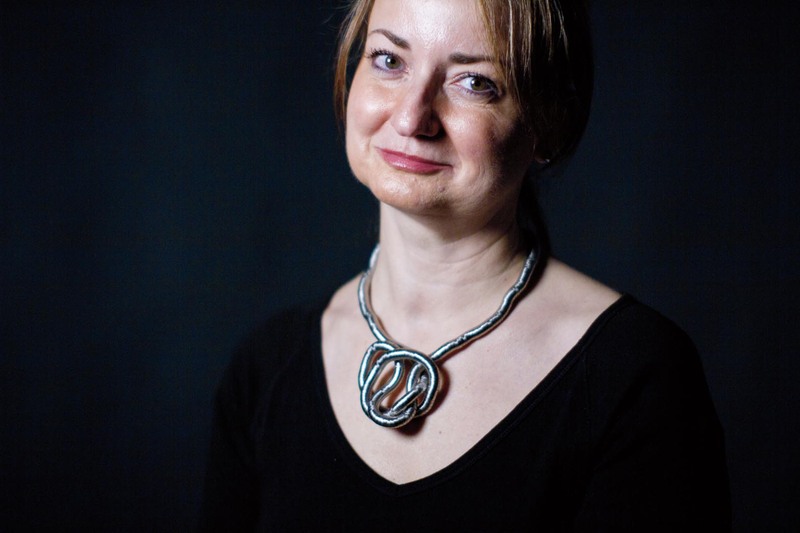 Katalin Vecsey, senior lecturer in theater, photographed by Phyllis Graber Jensen/Bates College. For instance, “an Irishman who has lived in the U.S. for many years and was educated at Harvard will speak differently from an Irishman who has never left Ireland,” says Katalin Vecsey, senior lecturer in theater who has taught at Bates since 1996. This year’s winner of the Kroepsch teaching award, Vecsey moved to the U.S. from her native Hungary in 1995, but remains close to that nation professionally and otherwise. She maintains a residence in Budapest and stays close to the Hungarian theater community. Bates students profit from that proximity. Seven times since 1999, during Short Term, Vecsey and Dana Professor Theater Martin Andrucki have brought students to Hungary and the Czech Republic to study theater and film. The worth of the experience derives in part from the fact that repertory theater is much more common in Hungary than in the U.S. Many companies “have eight, 10, 15 plays in repertoire, and run those shows as long as there is audience interest,” Vecsey says. One thing Caroline Sheridan ’12 learned about her art in 2011–12 is that less is sometimes more. Having seen Sheridan crowd her canvases with pigment, Robert Feintuch, the senior lecturer who works with studio art majors leading up to the Senior Exhibition, at one point jokingly accused her of artistic “horror vacui” — fear of empty space. 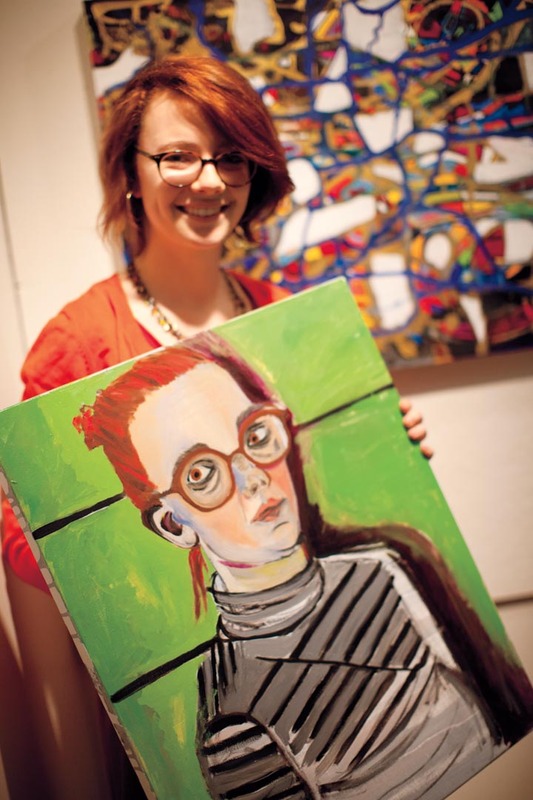 One thing Caroline Sheridan ’12 learned about her art in 2011–12 is that less is sometimes more. Photograph by Phyllis Graber Jensen/Bates College. So she eased up and left more white space. “That was one of the best things I got from him,” says Sheridan, shown above holding a self-portrait. The first Bates student to pursue abroad study headed to Tokyo in 1956–57. Sixty percent of Bates students will study abroad during their college time. Joining an honored tradition, Sen. Ed Muskie ’36 once read George Washington’s inaugural speech on the Senate floor. Sophy Min ’12 teams with Erica Long ’12 for an impromptu art sale in Commons. Photograph by Phyllis Graber Jensen.